Head to this tiny Italy-loving coffee shop on a weekday morning and you'll find older Italian men in suits sipping on strong macchiatos. 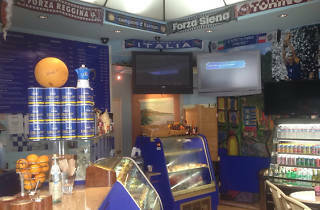 The blue interiors are covered in kitschy soccer scarves and signed memorabilia. Order up any of the coffee drinks, brewed using their customized blend straight from Genoa, Italy. 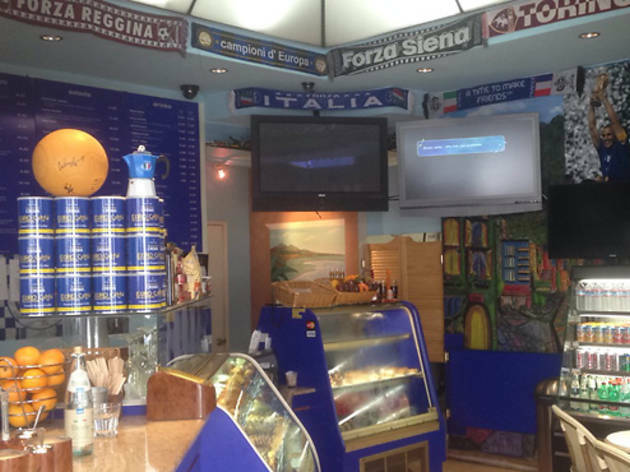 Nearby restaurants and shops are also serving the Euro Caffe blend. If you ever needed a getaway without getting away, head to this kitschy shop for a shot of espresso paired with Italian pastries, paninis, salads and more. The reads here are even in Italian—newspapers and magazines such as foreign titles Chi, Oggi and Italian Vogue.